Content by Tony Macklin. Originally published on October 28, 2011 @ tonymacklin.net. On rare occasions, a movie comes along that does genuine honor to Alfred Hitchcock. Take Shelter is such a movie. It could be subtitled "Take Shelter with Hitch." Director/writer Jeff Nichols knows the master well and employs Hitch's technique of manipulating his audience and keeping them off balance. But it's more than style. Take Shelter is steeped in Hitchcock lore. Take Shelter takes place in seemingly Elyria, Ohio, and its environs, and in the mind of protagonist everyman Curtis (Michael Shannon). Curtis has terrifying nightmares that keep him in constant dread. He comes to fear his dog, a co-worker (Shea Whigham), the natural world, and even his wife (Jessica Chastain). But he is not crazy, is he? He is disoriented, disturbed, contemporary man. We live in a nuclear world. How does one relate to paranoia, absurdity, alienation, and Apocalyptic visions? Curtis decides he must transform the storm shelter in his backyard into a livable refuge. While struggling with his personal demons, he stays committed to that obsession. Most of us can control our fears, but Curtis is vulnerable. His mother (a haggard Kathy Baker) was institutionalized in her thirties for schizophrenia. And Curtis is unable to quell the overpowering nightmares and their menace. There are threats out there. Politicians today, as always, and their advertising agencies exploit the vestigial, gaping fears of the people. Nichols' and Hitchcock's exploitation is much more fun. Take Shelter is not in the cellar of the Bates' house, but has a storm cellar in rural Ohio. Birds fill the air. Gulls fill a beach. A sunny environment has a view of something decidedly unsunny. In perhaps the most sly image of the year, Take Shelter has a shot of a fly near a knife. That's sublime. The ending may seem too coyly fatalistic for some viewers. But that's Hitchcock territory. The gifted cinematography of Adam Stone makes objects and locales evocative. There is suspense in objects -- a structure, a faucet, a lock, a key. Environment warns and shifts. As with Hitch, the acting in Take Shelter often has understated eloquence. Michael Shannon, as Curtis, has a role that might have been done by Tony Perkins 50 years ago. Shannon is forceful and convincing as the anxiety-stricken family man. Shannon broods as well or better than any actor today. Light-haired Jessica Chastain, as Curtis' wife Samantha, gives perhaps her best performance as the loving wife who struggles to retain familial balance in the face of impending chaos. It's a subtle performance. Tova Stewart is engagingly believable as the innocent, young daughter Hannah, who needs an operation for her deafness. Sign language is one of several canny symbols. The three actors who portray the family bring humanity and some normalcy to the bizarre. Hitch would love their vulnerable humanity. 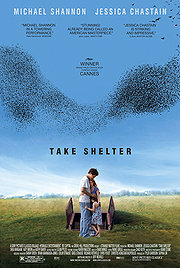 Take Shelter is one of those few movies that almost demand discussion after one leaves the theater. It's allegorical, which means it is readily open to more than one interpretation. What is real? What is the threat? Is it the old chestnut -- or in this case, buckeye -- that it could be a dream? Is Ohio North or Northwest? The most enlightening discussion probably would be the one between directors Nichols and Hitch. I'd like to be a fly on that rear window.